Spartan Logistics is Officially in Operation! Spartan Logistics, a warehousing and transportation firm headquartered in Columbus, OH is officially in operation on Jenny Lind Road in Fort Smith, AR. 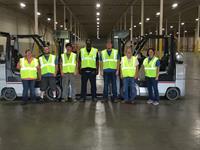 The Spartan warehouse received its first customer shipment this week at the former Riverside Furniture warehouse. In January of 2016, the owners of Spartan Logistics purchased the vacated building, acquiring over 400,000 square feet of high quality distribution space and bringing their Arkansas portfolio to over 1 million square feet. “Our real estate strategy is to opportunistically acquire great assets in markets with low vacancy and either lease or operate them. This asset is partially leased to a Fortune 500 global company and now we are able to consolidate the operations of a new customer.” says Steve Harmon, President of Spartan. “Additionally, we have at least 100,000 square feet available as renovated public warehouse space that is rail served in Northwest Arkansas.” Spartan’s two Fort Smith locations currently employ 20 people in a variety of leadership, transportation, and logistics functions. The Fort Smith Railroad is a short-line railroad headquartered in Fort Smith, Arkansas. FSR operates an 18 mile line in Arkansas from Fort Smith (where it interchanges with Kansas City Southern Railway, Union Pacific Railroad, and Arkansas and Missouri Railroad) to Fort Chaffee. Fort Smith remains a gateway to and from the West as a mecca for manufacturing businesses to call home. “Fort Smith is a great location for our new facility, offering favorable logistics; but perhaps most important is the high-quality work force and large manufacturing base in the area.” Steve Harmon said.